Cebu City - CEB (12 km NE) From the Mactan International Airport: Take Airport Rd. to Pusok Ave. left on Pusok Ave. to Marcelo Fernan Bridge(Cortes Blvd.) right on Cortes Blvd. to Mandaue Highway, left on Mandaue Highway to Juan Luna Blvd., right on Juan Luna Blvd. 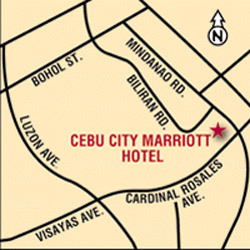 to Cardinal Rosales Ave. Cebu City Marriott Hotel is about 30 minutes (12 kms.) from the airport.